Google Hangouts had its issues as an SMS/MMS app, but Google has pretty well sorted them out. Even so, it sounds like Google may be giving up on having Hangouts handle SMS, if a new rumor is to be believed. We're hoping that this is another test and Google doesn't go through, because Hangouts has turned into a solid all-around app. According to a source for Phandroid, the next version of Hangouts may remove the option to handle carrier SMS and MMS and urge users to download Google Messenger instead. That said, it sounds like those using Google Voice or Project Fi (which is still Google Voice) will still be able to use Hangouts for SMS/MMS, which is a good thing, since the Hangouts experience is far better than the all but abandoned Google Voice app. Messenger is a solid app though, so the change may not be too bad for others. Still, the change doesn't make a lot of sense. Yes, Messenger is a better SMS experience than Hangouts, but many users do like the unified experience. Maybe Google thinks splitting it up will make things less confusing, but we're not sure. What do think? Should Hangouts drop SMS support? no. it wouldn't affect you at all. since you're blocking carrier SMS but using Google Voice SMS, you just keep using Hangouts the way you are now. Even if the Verizon SMS came through it wouldn't end up in your hangouts inbox anyway, so probably MORE of what you were after actually. 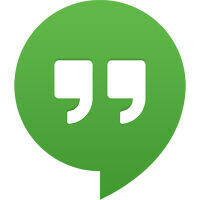 Tried the hangouts but hardly anyone I knew use it. iMessage is awesome. Glad to be back on a stellar os. I wondering the same thing why can google have google voice work like imessage, it id one of the reason I still keep iphone/ipod around for facetime relatives. The good thing about Hangouts is that if you are on Android (particularly a modern version), Hangouts is native to the device and the users have access to it, so even if they are not using it, you could probably send them a message and at least a notification will pop up (just gotta make them aware of it). Also, iPhone people can get the app and you can chat back and forth. You can even video chat with them just like Facetime. I don't think Android has access to iMessage. Not just avoid using their app, control the others with DisableService and XPrivacy :) Too many spyware nodes in Android...iOS, just restrictive all around and less transparent. No way! It's the best combo there is! They better leave it alone. Typical of Googhoul: concoct a great idea, botch its implementation, mire it with more bugs, ditch it after losing interest. Lmao good. Too many issues. Make something better and stock like iMessage. Why break the user experience as it is? I just don't get google sometimes. I'm guessing its not making them as much money as they want it to (however that works). All I can say, is please don't. I wont have two apps to do what one can do now, I'll just switch. I used messenger for quite a while and I have to say that when I tried Hangouts for sms, it seemed smoother for me. Not sure if it's because it sent messages faster or because of the smooth animations, but I wouldn't be too happy to go back to messenger personally. No wonder Google has been removing all the good features (like the widget) from hangouts. Now I have a feeling Hangouts will wither on the vine, while the messaging app gets all the new features.